Artwork Panel: 32.7cm x 84.2cm ≈ 12¾" x 33"
Silk/Brocade: 42.1cm x 146cm ≈ 16½" x 57½"
Width at Wooden Knobs: 51.1cm ≈ 20"
DISCOUNTED: Has a minor wrinkle in the upper silk panel. Discounted to half price (would be $100+, as this was written by a real Japanese calligrapher). 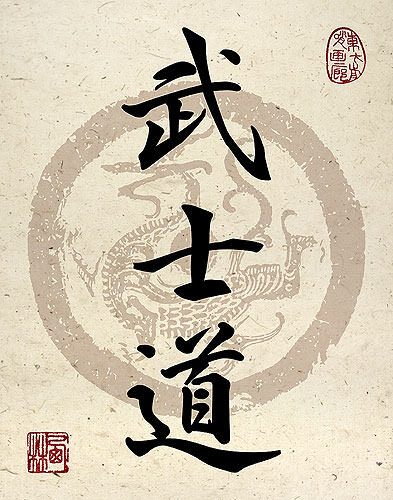 See our Bushido Way of the Samurai page for more custom Japanese calligraphy options related to Bushido concepts.